Quan Lan Festival is celebrated at Dinh Wharf on Quan Lan Island, Van Don District, Quang Ninh Province. The festival lasts ten days, from the 10th day to the 20th day of the sixth lunar month. 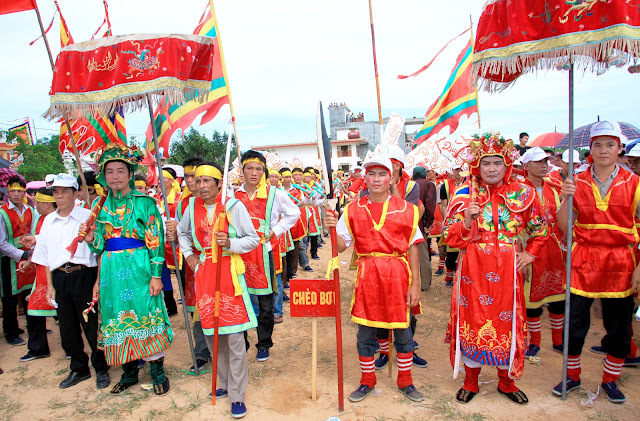 Quan Lan Festival is an annual festival of the locals on Quan Lan Island to memorize the historic victory against Mongol invaders in the 13th century and pray for a good fishing season in the year. On the 10th day of the sixth lunar month, an order of “closing the village” is announced. According to the order, all villagers are not allowed to leave the village but visitors are welcomed to the island and join the festival. On the 13th day of the same month, villagers are divided into two groups to practice and prepare for a traditional rowing competition. The competition is held on the 18th day, after a solemn ceremony at the Quan Lan Communal House built in the 18th century – one of the oldest communal houses of Vietnam. Quan Lan Festival is a highlight in village tradition of local residents on Quan Lan Island. It expresses a strong spirit of Vietnamese against foreign invaders.